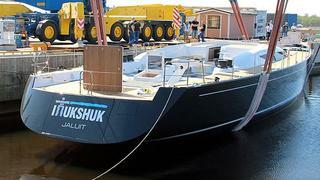 Ordered in July 2011, the Baltic Yachts B107 was launched one week ago by the Finnish yard under the definitive name Inukshuk. This 32.64m sailing yacht was designed by German Frers for an experienced owner. Built in carbon composite and created to be fast, efficient and comfortable, her exterior design is sleek and aggressive with a low-profile raised salon. She has a telescopic lifting keel, providing a shallow draught, and a carbon rig. The interior, designed by Adam Lay, accommodates eight guests in an owner’s suite, a VIP and two twin cabins. Crew quarters is for five in three cabins. Inukshuk was managed by Nigel Ingram of MCM, with Mark von Drashek as yacht manager and George Bourgoignie working closely with the owner. She will be delivered this summer.